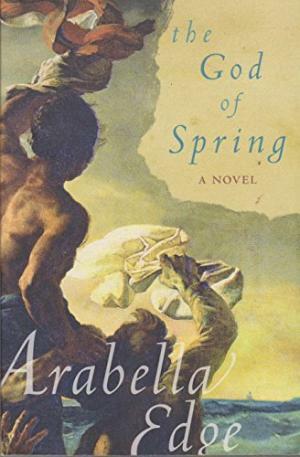 The God of Spring has been on my TBR for ages… I bought it because I was so impressed by Arabella Edge’s first novel The Company, which was shortlisted for the Miles Franklin Award and won the 2001 Commonwealth Writers Prize for Best First Book in the Southeast Asia/South Pacific region. The God of Spring has turned out to be even better than I expected and I am cross with myself for leaving it so long to get round to reading it. The novel, set in Restoration Paris in 1818, is the story of a great painting, The Raft of the Medusa, but it is also a study in character. Théodore Géricault (1791-1824) was – in real life and in this novel – a young man taking advantage of his uncle in more ways than one. His father wanted him to go into the family business, but he fancied himself as an artist and charmed his uncle into becoming his benefactor so that he could live a congenial life in a mansion, buy the very best in artist’s equipment and supplies, mooch about in Rome despising the work of neoclassicist artists, and cuckold his uncle into the bargain. When the novel opens Théodore is obsessed by his torrid affair with his aunt Alexandrine and suffers only desultory pangs of guilt over it; he is also supercilious towards his frivolous neighbour Horace who is cheerfully painting exactly the sort of insipid paintings that the restored court desires. Théodore – having won at the age of only 21 a Gold Medal at the Salon for his painting The Charging Chasseur, – feels pressured to paint something equally impressive because he feels it is his destiny … but inspiration, alas, has deserted him. However, by chance he hears the story of the shipwreck of the frigate ‘Medusa’ and when he seeks out the two surviving witnesses to the catastrophe he realises he has found his subject. From a third person narrative revealing Théodore’s attitudes and motives, the story reverts to the near past through the third person narrative of Savigny, the ship’s doctor. The reader learns the details of this celebrated shipwreck and the loss of 150 souls, abandoned on a makeshift raft off the coast of West Africa when the Medusa sank. Savigny, who initially documented the emerging social conflict on board out of idle interest, not only reveals the incompetence, stupidity and venal irresponsibility which led to the loss of the ‘Medusa’, but also the perfidy which led to those on the raft being cast off to fend for themselves. This part of the novel is utterly unputdownable. Alongside this compelling drama and the emerging realisation that there is more to be told about how the surviving fifteen clung to life is the delineation of an intriguing character. Théodore moves from one obsession (Alexandrine) to the other (telling the truth of the shipwreck in his art), and as he undertakes the heroic endeavour of capturing this catastrophe in paint, he learns about himself. He realises that his desire to break off his amorous obsession is partly because he wants an intellectual partner and he wants the companionability of a wife. He comes to understand that by hosting the survivors at his home he has imprisoned them in their victimhood. He discovers that he has underestimated Horace, and his attitude to Alexandrine alters entirely, in an unexpected way. He also learns that there is a price to be paid for learning the truth of events. As The Raft of the Medusa takes shape, Théodore also becomes the artist he wants to be. Some of the details of his research make grim reading, but the description of how this artist created numerous studies for his painting and made decisions about colour, texture and style is fascinating. Especially interesting was the process by which he decided which moment of the drama he would convey: the betrayal of abandonment; perfidy aboard the raft; the loss of all hope; or the moment of rescue at last? The God of Spring is just the kind of historical fiction I like. Available second-hand from Fishpond: The God of Spring and there was also a copy at Brotherhood Books on the day I looked. You could also try your library. Thanks Lisa for a most enticing review. I too have a copy of this one on my tbr which has been languishing there for years. I am in dire need a good read as I have recently read and LOVED ‘Any Human Heart’ by William Boyd and it was so good I have been unable to pick up another book that really grabs me…..have you read the Boyd I refer to? Ah ha! I bet we both have the book because it was an ANZLL nomination! Thank you, Lisa. Sounds like just my kind of book too. I’m often drawn to books with a painting underpinning the story and there are quite a few – I’m in the middle of The House Between Tides by Sarah Maine. Gericault sounds like a fascinating character. I even enjoyed the Wikepedia entry! And when I clicked through to his painting of the wounded cuirassier leaving the battle, given its date, I decided it had to be the very same “cuirassier” John Molloy talked of who wounded him in the final hours of the Battle of Waterloo. ( I like a good coincidence and a neat ending… ) Anyway, will seek this one out soon. What a fascinating connection between Molloy and this book! Sounds good. Onto the TBR pile it goes. Oh Lisa, if only you received a dollar for every book you cause to be added to your readers’ TBR piles! You’ve convinced me – I’ll be reading this one very soon!